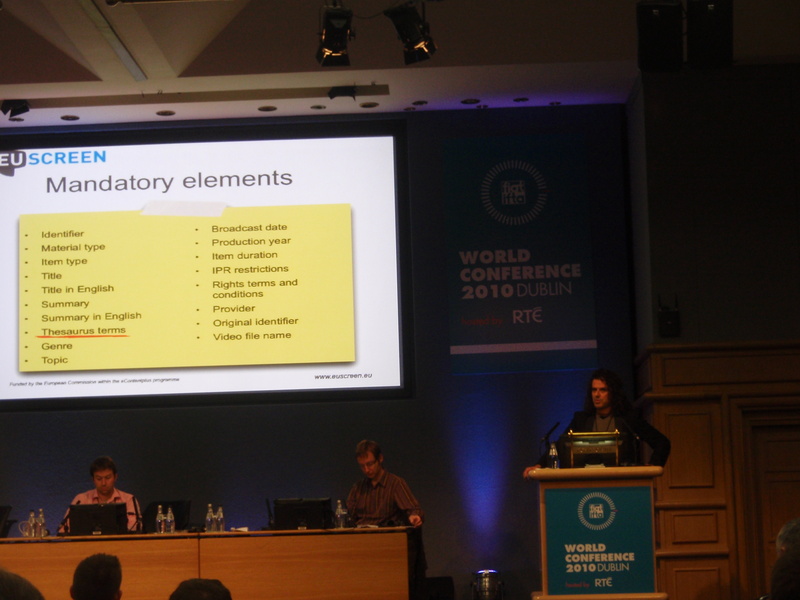 The EUscreen project was presented to a professional audience during the FIAT/IFTA World Conference 2010 which took place in Dublin from October 16th to 18th. Johan Oomen gave a plenary presentation about the project and its links to Europeana and addressed questions of how to safeguard the audiovisual heritage. This presentation was held in conjunction with a presentation about the European Film Gateway, represented by Georg Eckes. In the afternoon of the 18th, Rob Turnock, Johan Oomen and Marco Rendina showed the current status of the project during a EUscreen dedicated workshop. The workshop focused on how EUscreen makes television history ‘real’ and about the kind of television history EUscreen is representing. The presentations included the content selection policy and the metadata schema. The event was attended by a large audience and it was a success.